The Canadian carrier Rogers is preparing to launch two Xperia devices this month, the smartphone arc and the Xperia Play. Both of these two Android 2.3 smartphones are now available on Rogers website for pre-order for $99.99 with a 3-year contact (voice + data agreement) with minimum combined monthly service fee of $45. This price is available for new or existing Rogers customers. Rogers Canada offers the Sony Ericsson Xperia arc in the black color and the Xperia Play device is available in white or black. Xperia arc is powered by a 1 GHz Qualcomm Snapdragon processor, runs on Android 2.3 Gingerbread OS and has 8 megapixels camera with LED flash capable to record videos at 720p resolution. Xperia Play comes with a 4.0 inch capacitive touchscreen with 480 x 854 pixels resolution, and is the first PlaySation certified phone that offer a great gaming experience. 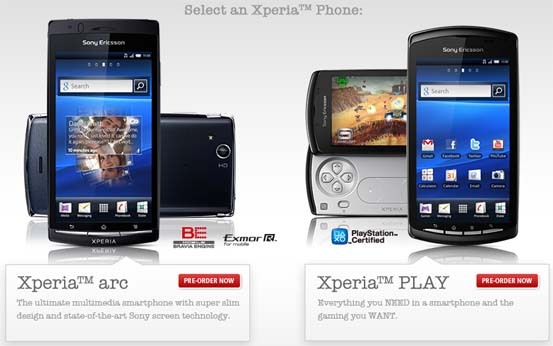 Xperia Play and Xperia arc will be available in Canada exclusively through Rogers.